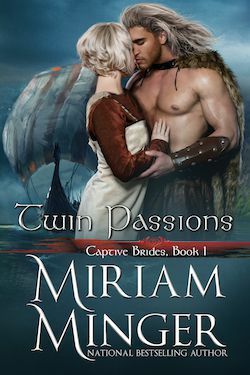 Beautiful, feminine Anora finds her wedding plans suddenly shattered when she and her identical twin, tomboyish Gwendolyn, are kidnapped and taken aboard a Viking ship. While the handsome captain mistakes Gwendolyn for a boy and appoints her his servant, Anora captures his heart and he vows to have her. To preserve her sister’s maidenhood, Gwendolyn initiates a dangerous game. Will the twins be rescued before Gwendolyn surrenders to her own passion?